I was extremely pleased and relieved that the smaller sleeve unraveled easily, and knit back up well. I was more careful this time, and had a blocked piece as a model. This time, it worked out well, and the pieces match. Whew. I was dismayed when I blocked the sleeves – can you tell that they are different sizes? I tried very hard to avoid that issue! The sleeve on the left is a full inch shorter and an inch narrower than the sleeve on the right. Fortunately, I have plenty of yarn, and can knit a new sleeve, if need be. First, I’m going to try to unravel the smaller sleeve and rework it. Unfortunately, the fiber is silk, and I expect that unraveling will not be an option, as the fibers will have started to felt together in the blocking process. Also, fortunately, the rest of the project – blocking the front and back, and knitting the picot border, seem to be going well. All we have here is a minor setback. I hope. Yes, I know that the right sleeve is wrong side up – It took me a while to figure out why the two sleeves looked different, besides the size. OK, so I am allowed to change my mind. The original sweater for older daughter, Jujuba Sweater, is not working out. I started and unraveled it three times, and could not get it small enough for my daughter. Also, the very loose-fitting pattern was going to be much too big, and I never really cared for it, anyway. This is Berroco Lago yarn, which is a Rayon/Viscose linen yarn. It’s a little slippery and has a bit of sheen to it. Works up a bit like ribbon yarn, so doesn’t go with just any pattern. The daughter picked it out, though, so I would like to knit something for her that she would actually wear. Berroco really had nothing appealing in their pattern inventory that used this yarn. I finally gave up and started looking around for something that might be adaptable, and found “Minimalist Cardigan” published in Interweave Knits, Fall 2007. 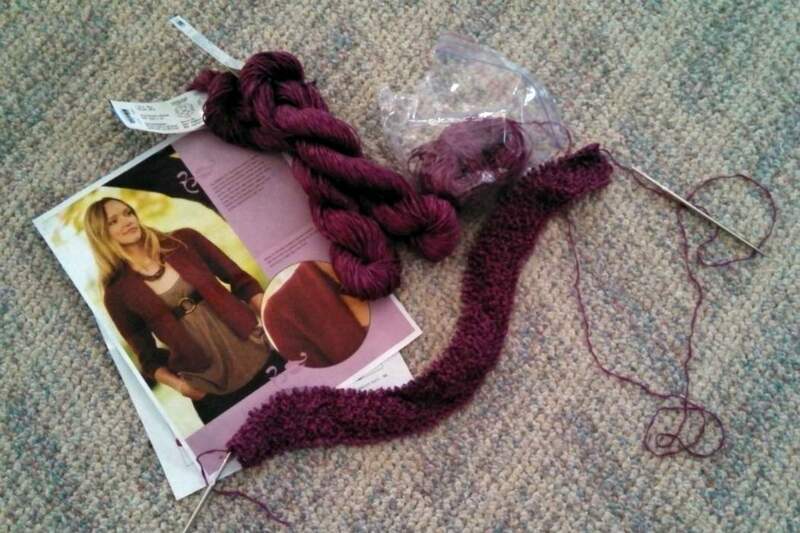 I think the drape and moss knit pattern will work with this yarn, and it’s a fairly easy pattern (always a plus). Tip – for slippery yarns that are likely to unravel and create a tangled mess, I put the yarn ball in a snack-sized zip bag. It’s clear, so I can see the yarn, and corrals the yarn so it’s less likely for the yarn ball to fall apart.